In line with Bangladesh’s national goals and the Sustainable Development Goals (SDGs), Government of the People’s Republic of Bangladesh is prioritizing on successfully implementing its newly launched National Social Security Strategy (NSSS). The General Economics Division (GED) and Cabinet Division are spearheading the implementation. 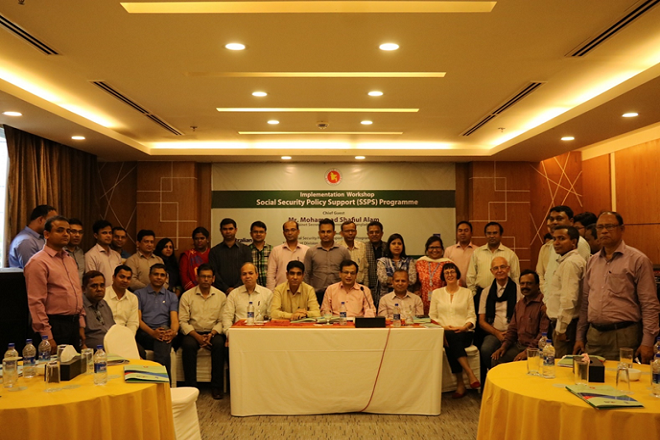 Through its joint project, Social Security Policy Support (SSPS) Programme, GED and the Cabinet Division have been collaborating to address Bangladesh’s social development issues from a coordination and reform perspective; SSPS has been rolling out the NSSS reform in 35 ministries. Recently the project, with Technical Assistance support from United Nations Development Programme (UNDP), has been extended for two years till 2019. To facilitate smooth implementation of the NSSS for the next two years, SSPS arranged an implementation plan sharing workshop at Royal Tulip Sea Pearl Beach Resort, Cox’s Bazaar from 27-28 March 2018. The workshop focused on SSPS’ progress, future action and implementation plan and key issues for NSSS reform. Considering the ongoing Rohingya crisis, the workshop also included a special session on understanding social protection needs of the host community and Rohingyas in Cox’s Bazaar. Mr. Mohammad Shafiul Alam, Cabinet Secretary, Cabinet Division, Planning Commission, Government of the People’s Republic of Bangladesh, presided as Chief Guest. 33 participants including Mr. N M Zeaul Alam, Secretary (Coordination and Reforms), Mr. Dilwar Bakth, Additional Secretary (Administration), Mr. A K Mohiuddin Ahmed, Additional Secretary (Coordination), Mr. Khurshid Alam, Assistant Country Director, UNDP; Ms. Angela Naumann, First Secretary of Australian High Commission, and officials from the Government, UNDP and DFAT attended the workshop. As outcome of the workshop there came up a number of recommendations which include approval of the yearly Action Plans of the SSPS Programme, directives for meaningful integration of the NSSS action plan with the Annual Performance Agreement (APA); utilization of the second generation of Grievance Redress System of the Cabinet Division for better governance in social protection sector; enhanced social protection programmes for the host communities in Cox’s Bazar affected by the influx of the Rohingya refugees; and instructions for early finalization of the M&E framework for social protection programmes.